Recently, we've heard reports that the rapid decline in the price of gasoline, which is a reflection of the drop in crude oil prices, has brought about a sudden crisis in the petroleum production industry. For decades, we've heard that world oil reserves of easily extracted petroleum would "peak" sometime in the current century, then begin to decline, while demand, which has been steadily increasing, continued to climb--leading to catastrophic increases in price. At the same time, experts in oil reserve data have noted that as prices rose, the viability of less easily obtained petroleum sources, i.e., shale oil, would likely increase. As we've seen, these predictions have proven true. 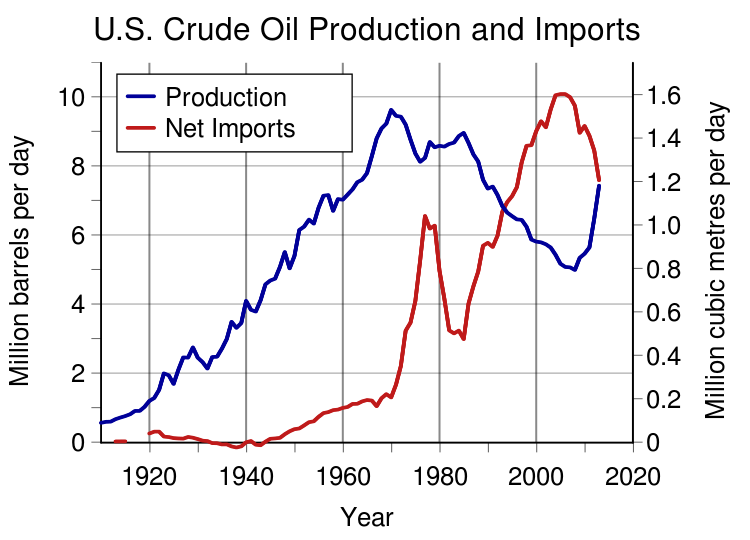 The burgeoning shale oil extraction industry has increased American petroleum production, to the extent that we now produce annual totals which rival Saudi Arabia and the former Soviet Union. The attractions of an increase in production are sold on the market competition which results in remarkable declines in prices at the pump. Any decrease in oil prices has a positive effect on the economy as a whole, which depends to such a large degree on the transportation network that runs off of petroleum use. We were also told that were America to become "less dependent" upon foreign oil sources, our standing in the world economy, and in the foreign policy sphere, would improve. Any decline in our dependence upon Middle Eastern oil, would improve our bargaining position in price competition, and make us less "vulnerable" to political pressures occurring in that part of the world. But as we have seen, protecting our interest in maintaining the flow of reasonably priced Mideast oil, was not the only priority. The flowering of Islamic terrorism has demonstrated that religious and political considerations may trump mere commercial interests. We may be able to get by for the time being, by coddling the Saudi royal family, but Islamic radicalism may eventually complicate our access to the oil fields throughout much of the Mideast. Official estimates put America's shale oil reserves at a level which would make them viable for another two and a half decades--or roughly until the early '30's--at which point they would begin to decline. That's assuming, it should be noted, that exploitation proceeded at a smart clip, an assumption that might founder on regional resistance to fracking or other destructive extractive practices. However, the sudden price drop we're presently experiencing has had the ironic effect of truncating the whole shale equation. Many companies are suddenly in the red, as the price of crude drops below their break-even point. The viability of fracking was posited on the high price of crude on the world market, but with the sudden surge in supply, brought about by the new methods, the price has dropped. The delicate balance between supply and demand has meant that the transition from easy extraction to difficult will have contradictions that aren't easily overcome. In the context of global warming, we're obliged to consider not just the long-term advisability of rapid over-exploitation of the earth's resources, but the more immediate problem of excess burning. We'd be advised to save a little, going forward, instead of finding excuses to forge ahead into an unknown in which both supply and price precipitate us over yawning scarcity, bringing about a world-wide economic decline. In the overall picture of energy use and reserve, we need to see shale oil exploitation as a temporary phase, not as a long-term solution. It isn't going to measurably lengthen the time upon which mankind depends upon oil as a primary energy source. It might enable us, given current use levels, to keep using it generously for another century, at most. But then what? As the market-patterns sail along, riding wave and trough in tandem, we may be seduced by each successive small condition, to think that a new paradigm is spreading out around us. But these "blips" are nothing more than minor variations. As readers of this blog know, my priority has always been to suggest moderation in population growth, rather than promoting economic growth--with its attendant profligate confiscation of resource--as a way to slow the birth rate. Population is always used by apologists for exploitation, as the bottom line--more mouths to feed, more jobs to create, more cars to sell, more water, more food, more sewage, more pollution, more crowding, more conflict--for justifying expansion. But each iteration of supply leads inevitably to more demand, so that promoting one, without moderating the other, only makes the problem worse. We've been using that model for at least a hundred years, and look where it's brought us. The simplest way to slow demand is to reduce it. Period. Every sport has its attractions, which may or may not be easily conveyed to those unfamiliar with it firsthand. Fly-fishing, which developed over centuries of practice, originally as a hunting and gathering skill, has become a highly sophisticated form of sport. Whereas it once was principally about the securing of sustenance, it has morphed into a refined procedure, with a tradition, and a set of formal methods and conventions, that have become almost ritualistic. With its paraphernalia--the rods and reels, lines and leaders, artificial flies, creels, vests, boots and so on--and its prime watering holes, with their shrine-like folklore-fame--it has acquired all the trappings of a faith, a devotion which may border on fanaticism at times. It's important to remember that the reason people pursue any sport is the nurturing pleasure and excitement it affords, whether or not the rules are slavishly followed. A recreation may be considered a pastime, or something more. Whatever you love you do with a kind of rote allegiance--what may described as passion, even sanctity. Flyfishing occurs in nature, along waterways, in streams or rivers, or on lakes. Water, and the life that inhabits it, and the country through which it flows, is the setting, and the interaction between the pursuer (the fisherman), and the pursued (the fish), may only be a pretext for an appreciation of the qualities and complexities of the natural world, which are experienced first-hand by fishermen. The rhythms of the seasons, the accompanying flora and aquatic ecology, the richness of streamside life, the sights and sounds and sensations associated with being near, or in, a flowing stream, all contribute to the experience of fishing. We may become so preoccupied with the motions and rituals of performance, that we forget the fun part. For me, flyfishing has never been purely about the successful seduction of the fish, of hooking and landing it and glorying in the triumph, of winning a contest with other competitors or against the odds. It's never been about how skillful my cast is, or whether I use the "correct" fly, or any of the dogmatic prescriptions that govern the hierarchy of appreciation and duty of the sport. When I fish, I enter a special place, where civilization and its discontents are left behind, and I become in some degree a part of the forces of the natural world, in a way I never am, when getting and spending and being the responsible citizen in a busy world. Time, like water, flows relentlessly forward. Nature is about change, and flowing water reminds us that our lives are slipping by, that as we step into a river, as the current pushes against our legs, we are being pushed forward, towards our end. We know this as surely as anything, though it may be pleasing to be caught up in the excitement of the hunt. On a fishing day, we may enter the water in late afternoon, preparing for the evening hatch. Insect hatches are rhythmic, but not entirely predictable. Everything that lives in water has a time-table, but empirical observation can't tell you exactly when a hatch is going to occur, or how the fish are likely to respond. The tantalizing possibility awaits you on the water. With dry-fly fishing, which is my preference, the lure floats on the surface of the current, meandering over the intersecting flows. The fish, always watchful, are "fishing" (or hunting) too, and hoping for a safe pursuit of the bugs. Usually, with their natural shyness and caution, they will also have some comprehension of what the fishermen are trying to do. It's a contest between their reluctance and shrewdness, and the fisherman's guile and ability. The tension of this interaction is what makes fishing fascinating. There are a dozen factors that influence how the fish will behave, and at least twice that many that fishermen must observe and employ in their pursuit. The surface of the water is like a membrane between the two worlds--one wet, the other dry--a plane of division, which is sometimes referred to as the "surface film." This is where the game is played. Most of the time, you don't actually see the fish, so the moment of crisis (the rise or "strike" of the fish to the lure) can't be followed. Suddenly there is, from the mysterious under-side of this membrane, an attack, subtly gentle, or vicious. Fish are predators, and their actions are designed to succeed. But you can never really know if or when the fish will respond. You hope, and guess, and try to learn from failure. Why do certain approaches work, while others fail? Towards evening, the fishing may be good, or it may be slow. As dusk turns to night, what you can see begins to fade. The water is turning black under you, and you can't see your feet. Perceiving your line as the sky darkens becomes more difficult. Your fly may become invisible on the water surface, though you have a good idea where it must be as it floats sideways across from you. You may have had a good day, or you might not have caught anything that day, but whatever the "luck" you don't want to reel in and go back. A little evening hatch may have started, and there are quiet dimples all around you, as the fish rise from the obscurity of their holding places below. The moon rises, spreading an ethereal glow over the water. 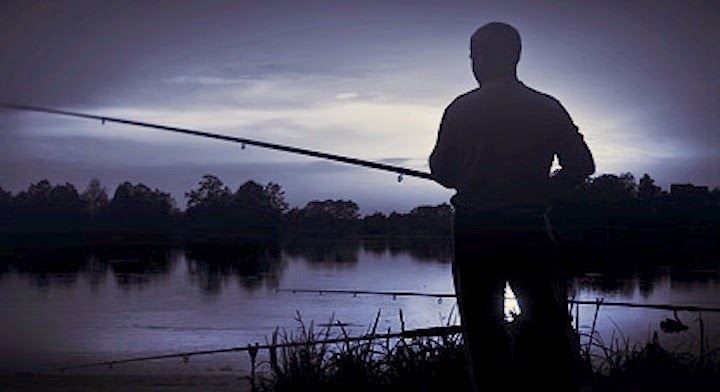 It's late, you should be knocking off, but you just keeping making one more cast, then another, and another. You're being stubborn. This refusal to give up is something all fishermen feel. It may keep you out well past dinner time; your buddies or your friends may be standing on the bank, reminding you that it might be a good idea to let go. Finally, reluctantly, you reel in your line, turn carefully around in the current, and wade gingerly back to the bank. This time, when the water is pitch black, and the silhouettes of the trees on the opposite bank are vivid against a darkening sky, seems magical to me. Almost dreamy. There have been times when I have hooked a good trout, just as the sky was turning dark, and the fish and I are locked in battle. At these times, you feel at a distinct disadvantage with the fish. You can feel where the fish is going, from the pull and throbbing action of the line through the rod, but it's mysterious, like anything that happens in the dark. Your attention intensifies, mind focused. I have often lost fish in these circumstances, but it doesn't feel like failure--since landing and releasing a fish in the dark is difficult. I've come to see these times, with night drawing on, as very moving, with the murmur of the water, the beautiful shifting, undulating surface, and the certainty that there are only so many such moments accorded us in this life. Their fragility, transitoriness, and beauty. They are an end in themselves, not a means to another end. We are living in this life, the only one we'll ever have, and that fact makes everything that happens unique, and precious. 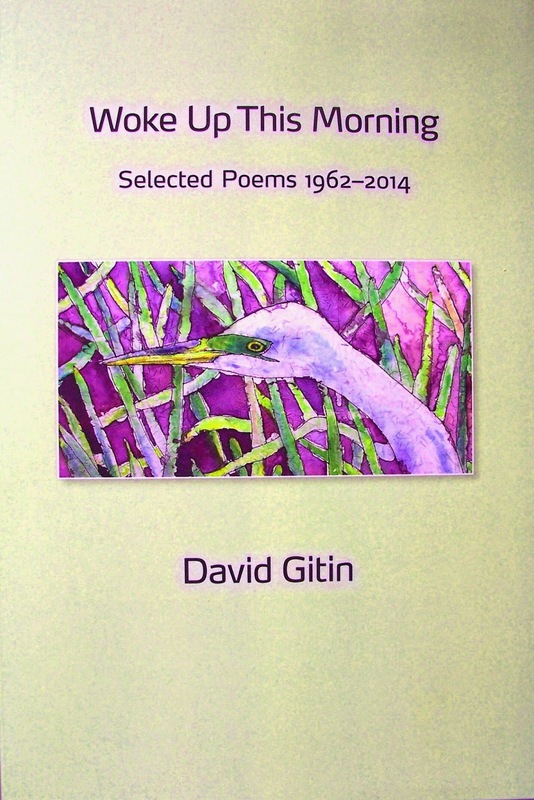 I've written about David Gitin's work before, here, and here. As with his previous book, The Journey Home [Berkeley: Blue Wind Press, 2010], this is a selection of poems, subtitled "Selected Poems 1962-2014." I have then the feeling that Gitin is engaging his previous range of work as a fertile ground, revising and selecting and sifting from among its varied fruit, instances which speak to his changing sense of who he now is, and what it all meant, in retrospect. In that sense, it's a summing up, or a summary of the meaning of his whole writing life. The simplicity of this kind of notation belies its hidden, though firmly grounded, sense of the underlying forces which govern nature, the universe at large. There's a joyous surrender to the larger dynamism of the world, particularly its lyric manifestations, in microcosm. The fact that the poems here are undated, and are apparently neither chronological nor thematic in arrangement, contributes to the apprehension of their numinous indeterminacy, which I see as integral to the overall intent. This isn't a personal history, not a journey, but a kind of continuous present that asks to be seen through a single, general lens. None of this explains the exquisite charm of Gitin's verse, which is like an alembic of a wistfully nostalgic counter-culture reminiscence, of a time when our generation believed in the power of individual conscience, community cooperation, grass-roots initiative, and the delight of simple gifts. Though the initial effect of such deft little snapshots like this is joy and delight, it isn't easy to convey the accretive impression they leave, when read in quantity. Though their brevity and flitting elusiveness suggest haiku or minimalism, they clearly come from a more embracing and universal vision. Such quick graphs of observation and notation, when gathered together in sequence, create a wave of intention which tends to overwhelm the initial event, drawing our attention up into a higher state of consciousness, of--for want of a better term--the sublime. The antecedents to this approach would certainly include Oppen, and Eigner, the ancient Chinese. Gitin appears to have moved beyond the packed particulars of his earlier work, to a more consuming ecstatic, but his work is always just saved from vagueness by its specificity and clear clinical eye. And there's a crucial restraint in his method. The desire to see universals or deeper significances in ordinary phenomena is characteristic of a certain kind of romantic visionary writing. Usually, I tend to be suspicious of this tendency, but in Gitin's work, I'm never offended by it, perhaps because his assertions seldom rise to the level of direct conviction, are always hovering on the lip of belief--provisional, balanced. Though this book feels conclusive, I prefer to see it as conditional, since there seems no end to its program. May he find in Florida--"veneral soil" (Wallace Stevens)--a rich context for his continued musings. We begin this year on a couple of sour notes. First, our beloved 49ers lost no time in parting company with their head coach Jim Harbaugh, following the last game of the current regular season. 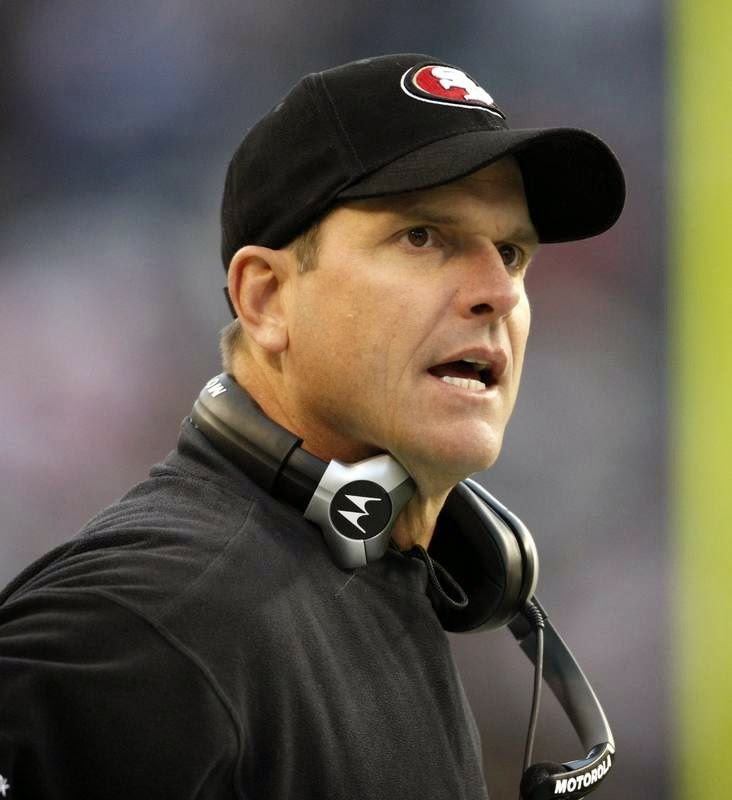 To review Harbaugh's career, in brief, his tenure with the team lasted from 2011 to 2014. During that four year span, his combined record (the team's) was 44-19. For rookie coaches in the NFL, this is almost without precedent. Only one other head coach I can think of--x-49ers head coach George Seifert, who went 98-31, taking over Bill Walsh's team at the end of the 1980's, bears comparison, but with a very large caveat--particularly when you remember that Seifert took over a powerhouse, while Harbaugh came to a team mired in a decade of mediocrity. A little history tells a pertinent story. When Eddie DeBartolo lost control of the 49ers, in 2000, the reigns were passed to his sister Marie Denise York. She and her husband, John York, a research pathologist, knew nothing about running a professional football team, and proceeded to mismanage the franchise into a 12-year slide, without a winning season. 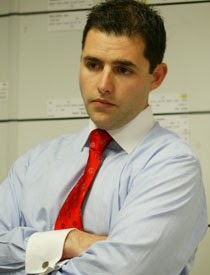 In 2008, the Yorks appointed their son, Jed, President of the team. Jed York, a finance and history major graduate of Notre Dame, had had no experience in sports, as a player, or a coach, or a sports teams manager. Nevertheless, he made a lucky choice in his new head coach in 2011, hiring Harbaugh away from the Stanford University Cardinal--and thus began the current four year run of winning. However, not long after beginning of the 2014 season, there were "leaked" reports from 49ers management, that there were severe disagreements between the team's management (York, and his assistant General Manager Trent Baalke), and Harbaugh. These began when the team's early season record was still very positive. The year before, Jed had "tweeted" a public apology for the team's failure to advance beyond the NFC championship game to the Super Bowl, "This performance wasn't acceptable." By mid-year 2014, a series of crippling injuries to some major stars on the team, as well as some poor offensive coaching schemes (an apparent wrong-headed attempt to turn scrambling quarterback Colin Kaepernick into a "pocket passer"), led to a series of losses, which in retrospect seem to have been, at least in part, a response to the very obvious mid-season attempts by York and Baalke to undermine Harbaugh's authority and reputation. The reported issue was Harbaugh's "abrasive" interpersonal style, a quality which would seem to have nothing whatever to do with the team's potential, or with the head coach's abilities as a field commander. In retrospect, it almost seems as if Harbaugh, and the team in general, had been deliberately "cut loose"--so that management would have a public "pretext" for replacing him, and turning over personnel at season's end. The Yorks have shown themselves to be rank amateurs in their management of the 49ers organization. Abandoning San Francisco, for a new stadium in San Jose, 30 miles south of their namesake city center, they've showed contempt and selfishness in all their dealings with the city, the media, and their own players. Ignoring the success their new head coach had brought to the team, they summarily dismissed him, in effect in mid-season, just to strut their power and hide their own incompetence--as far as anyone can surmise, simply because Harbaugh wouldn't kiss up. At this point, no one knows what the Yorks have in store. With Harbaugh now gone (to Michigan), it's expected that several high-profile veteran players will either be let go, or will themselves simply retire. After three trips to the penultimate play-off contest, and one unfortunate season, the 49ers are right back where they started under Jed York. It's a sad denouement to a relationship which had brought glory and gratitude to a team longing for respectability after a decade of shame. Jed York has proven, once and for all, that he's just a spoiled rich kid playing with lead soldiers in the converted nursery room. Second, yesterday marked the effective beginning of the year for California State legislative measures. Right at the top of the list was a new law allowing "Undocumented [i.e., illegal] Immigrants" to acquire valid California Drivers' Licenses. As far as I know, there have been no legal challenges to this law, which is causing unprecedented backlogs and slowdowns in DMV offices around the state, clogged with Mexicans filing the new applications. But it is clear that this new provision conflicts directly with Federal immigration laws, which forbid illegals from maintaining legal presence in the U.S., without going through the legal process of obtaining visas, or applying for citizenship. How can a person residing illegally in the U.S., acquire a legal identification and driving permission, without triggering a pursuit by the U.S. Federal Immigration and Naturalization Service, or Homeland Security? It's as if the State of California is setting itself up as a competing jurisdiction to our Federal Government, offering a kind of quasi-ersatz-American citizenship status, in direct violation of our nation's laws governing residence, citizenship and all the privileges pertaining thereto. As an American citizen, I would regard it as my right and duty to inform about any illegal whom I encounter in my work or daily life. If citizenship is to mean anything, it must be at the grass roots level, where ordinary law-abiding citizens stand with authorized law enforcement to prevent crime and violation. Granting foreign nationals a "free pass" to claim the rights and privileges which rightfully belong only to American citizens, is neither fair, nor acceptable. If you are here in the U.S. without papers, don't show up on my doorstep, or try to conduct business with me, because I'll report you.